Kat called me to ask a favor. She worked with me in Africa some years ago. We became friends, despite my sending her to a remote location in Africa for several months. “Absolutely.” Later I had a conversation with Duane, Casey’s father, which left us both choked with emotion. Duane told me more about his son. Casey was born July 16, 1982 in Lafayette, LA and passed away December 12, 2017. He was only 35 years old. Early on, he dismissed the PTSD as something to be ignored thinking it would go away. I’m sure he looked at it as weakness as many Veterans do. He finally sought help, later. Unfortunately, the help he received either wasn’t enough, was too late to work, or it simply wasn’t the kind of help Casey needed. Casey didn’t leave a note or explanation. 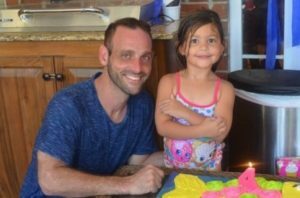 He left behind his family, including his five-year-old daughter, who were understandably devastated. So, for Casey and his family, I will walk side by side with Casey on the Camino during April. My steps will be devoted to his memory. 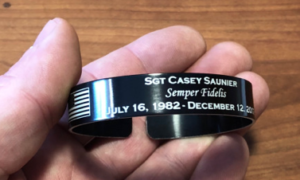 The Compostella I receive upon arriving in Santiago will be dedicated to him: To Casey, a fellow soldier who could not find his peace on this Earth. Brad founded Veterans on the Camino to assist veterans who suffer by offering guidance and assistance in making an extraordinary journey towards healing on the ancient Camino de Santiago. And here begins the April 2018 Camino journey. 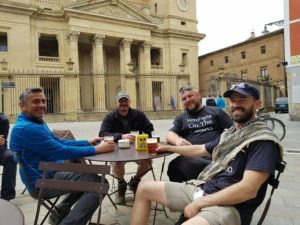 As spring neared, veterans on the Camino busily prepared for the next journey, slated to begin in April. The veteran participants were selected. Witold, Piotr, and Dan prepared themselves for their 500-mile pilgrimage. Veterans on the Camino was proud to be joined by veterans from our coalition partners, included both American and Polish veterans. This was especially potent for me as I served side by side with the polish during my tour in Afghanistan. One week before beginning the journey, the veterans embarking on this adventure checked and re-checked their backpacks, sorting, time and again, the meager supplies they’d carry on the 500-mile French Camino. The excitement of the unknown, the anticipation of tired and aching muscles, the eagerness to hear and share stories yet untold. The echoes of the millions of footsteps from over 1,000 years of Peregrinos already reverberated in their chests. Each veteran walking the Camino experienced the triumphs and the horrors brought about by battle. And each undoubtedly would find themselves revisiting those moments in the time and space that the Camino demands from each traveler walking The Way. Let me introduce you to my fellow veterans and peregrinos. Witold Kortyka: Born in 1965 in Sztum, Poland, he joined the Army in 1988 as a signaler. Witold served in the 13th Anti-aircraft Regiment and the 16th Infantry Division in Elblag. He deployed to Iraq 2004-05 Camp Alpha Babylon (Wounded in Action), 2007-08 FOB Echo Ad Divaniah, 2008-09 Ad Divaniah (Wounded in Action), 2010-11 Camp Bondsteel Kosovo and 2012-13 FOB Ghazni, Afghanistan. He was medically retired after 26 years of service with disabilities. Witold is now an active member of the Associations of Wounded and Injured in Missions Outside of the country, helping veterans to get back home and is also a lecturer at the military communication training center. Piotr Zbikowski: Piotr Zbikowski was born on 16th May 1978 in Szczecinek, Poland. He’s happily married and the father of two young ladies named Zuzanna and Łucja. Piotr currently studies investigation psychology. His military career began in 1997 when he joinedthe Polish Navy. Like many modern sailors, he also took a tour away from the water when he spent two years in Afghanistan with a military police unit. In his free time, he enjoys travel and cooking. Dan Huvane: Dan Huvane enjoys writing, only not when it’s his own bio. He has served as either active duty or reserve in the US Marine Corps since 1996, including deployments to Afghanistan in 2006 and 2010-11, and Kosovo in 2000. Aside from continued Marine service in public aﬀairs, Dan has worked in the past year as a ski maker, a sales rep, a wildland firefighting trainee, and a comm director for a disaster response nonprofit. A traveler, adventurer, communicator, volunteer and a big fan of mountains, he lives in Colorado where he’s attached to his sweet “wolf-dog” Daly. Dan is eager to make the pilgrimage to Santiago in memory of those he served with who made the ultimate sacrifice, and for his late brother Patrick James and his good friend Vince Gilligan Jr.
Brad Genereux is a 22-year navy veteran, Camino pilgrim, badass carpenter, who writes about veterans’ transition out of the military. During his own pilgrimage on the “Camino de Santiago” in Spain, he found self-discovery, healing, and redemption as he trekked the 500 miles to the end of the earth. 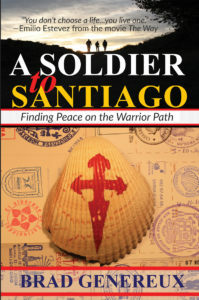 If you’d like to know more about Brad’s story, read his book, A Soldier to Santiago: Finding Peace on the Warrior Path.